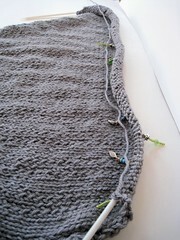 I cast off for Tree Jacket last night, now just to get it blocked! Expect to see a FO this weekend! 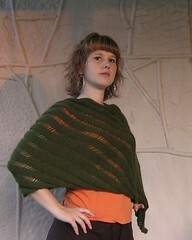 I’ve cast on for my second Clapotis, this one is for my sister by special request. 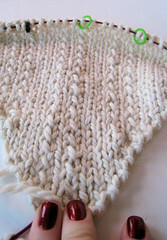 It’s Debbie Bliss Alpaca Silk, yum! I haven’t touched any of my other WiPs lately. 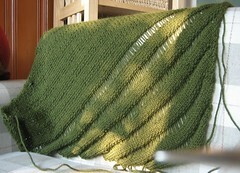 I’m planning to cast on for the Central Park Hoodie this weekend and start working on the Hemlock Ring Blanket again. I need to get that thing finished before it gets warm, because no one wants a wool blanket on their lap when it’s hot out! 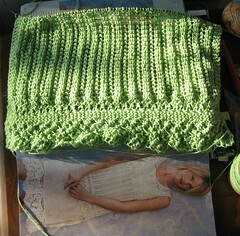 I’ll probably work on the Melon Pattern Scarf when I’m itching for lace. I got nominated for this award over at Ruby’s n Purls How cool is that? She says I “do Yarn Pr0n Fridays like no other” 🙂 And Carol over a Knitting Knot nominated me too! Here’s how it works: Give the award to up to 10 people whose blogs bring you happiness and inspiration and make you feel so happy about Blogland! Let them know by posting a comment on their blog so that they can pass it on. Beware! You may get the award several times! 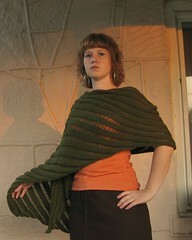 Robin over at Yarn Crawl – she’s a knitting inspiration! She knits so fast, she’s so nice and always helpful, plus did you know she has an almost encyclopedic memory of knitting patterns she’s looked at. Really, it’s amazing. Sauntering Soul – Not a knitter, I read her blog for a slice of life 🙂 What can I say? If we lived in the same city I’m 99% sure we’d be friends. She’s smart, funny, nice and real. Emily at Skyline Chilly – She was my upstream pal on my first (and last) Secret Pal. She was awesome as a pal, even better, when the exchange was over she kept on being awesome. 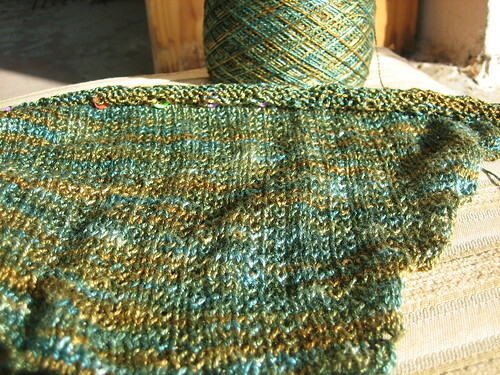 Turtlegirl76– she was one of the first knitting blogs I started reading. She always leaves helpful comments and suggestions. 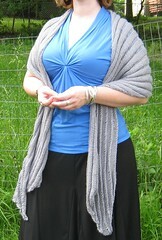 Just reading her knitting blog is an inspiration! 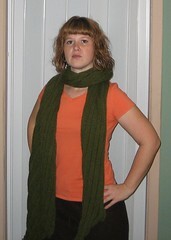 Weezelana over at Knittywhipped – she’s funny, she’s smart, she’s an awesome knitter. ‘Nuf said. Adrienne of Real Life: Live and Unscripted – she knits, sews, scrapbooks, does podcasts, takes great pictures, posts Throw Back Fridays, what doesn’t this girl do? And she does it all with an amazing attitude. 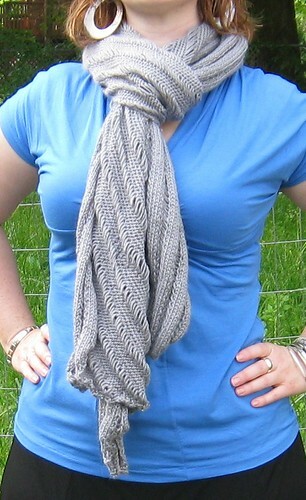 Kara over at Knitting Lemonade, she’s quitting her job to go live abroad. I am green with envy and I can’t wait to read about her adventures! Lara at Yarn It – among other things, she’s going back to school and still finds time to knit! You know how some people say if they won lotto they’d keep working? I’m not one of those people. I would never get bored. My ability to entertain myself is infinite. Yeah I’d probably take some college classes, but other than that my hobbies and interests would keep me busy. Now before you break out your family tree and try to figure out how we’re related, I didn’t win lotto, but I did have 6 days off from the library (I still waited tables 3 nights) and there was no way I was ready to go back to work. 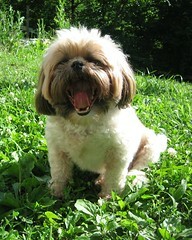 But the bills must be paid or there will be no Tivo or yarn and lets face it, I probably can’t live without either. So what did I do to entertain myself? 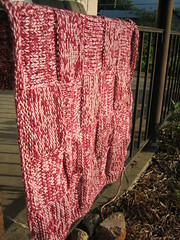 I mowed the yard, my parents visited for a couple of days, I read two junk fiction books that I wont even bother to blog about, I listen to the first three Harry Potter Audio books and oh yeah, I knit. A lot. 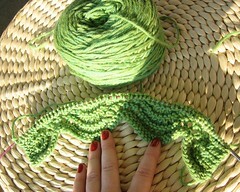 I’m surprised that my hand isn’t cramped because usually I’m lucky if I can knit for an hour straight. But as I was dying to know what was gonna happen to Harry I just kept listening, which meant I just kept knitting. First up! The Lace Tank round two. 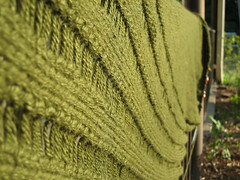 I wasn’t happy with the Elann Sonata, I had it in my stash and I like the color, but I didn’t like the stitch definition. So I went back to the drawing board for a new yarn. I’d be a lot further a long if I hadn’t spent so much time tinking. Apparently lace and margaritas do not go together. Not even one margarita. 🙂 I love the new yarn, and how it’s coming out. 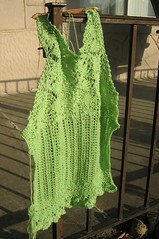 The Drop Stitch Lace Tank is blocked and really really done this time. I’ll try to get a picture sometime soon, but this week is looking to be a very busy one. 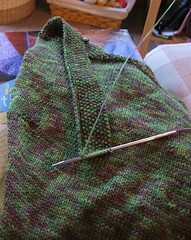 I started on the shoulder straps for Mentionable so hopefully in the next two weeks I’ll be able to declare that done. 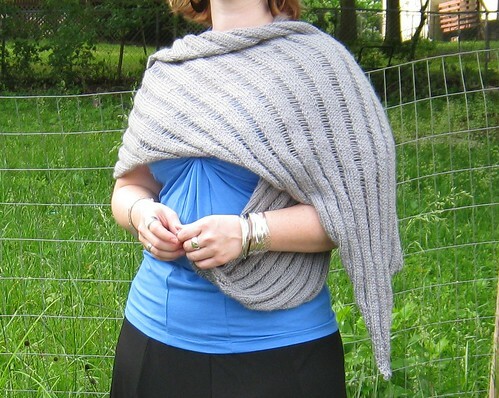 Last but not least – Clapotis Round Two! 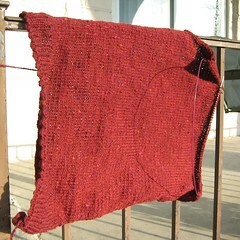 Even though I frogged my first attempt (I want to use the yarn for something different) I loved the pattern so I searched high and low (ok I just look at a LOT of flickr pictures) to see what yarns other people used. 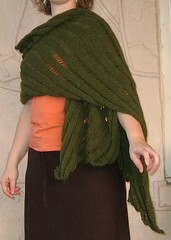 I went with Andean Silk in Olive, it feels so soft in the balls, but I think I have sensitive skin. It feels a bit itchy to me, plus it seems to shed. This worries me, I mean it’s alpaca and silk and some merino, does this mean I’m going to have a problem with alpaca and merino in general? Because eeeek! and crap! I guess I’d better look at my copy of No Sheep for You again. an illness that affects bloggers. Symptoms include wishing a meme would make the rounds so they’d have a post, searching other blogs for quizzes to post, inability to think of anything to write about and general lack of will to blog. 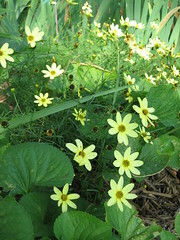 Thanks to Robin for giving a name to this illness that seems to be sweeping the blogosphere right now. I’m actually very busy right now, between the two jobs I haven’t had a day off since the 17th and wont get one until the 4th. Plus I’m working 2 weekends in a row at the library, so that means Friday night winery, Saturday library, run to winery after get off from the library, Sunday library. Makes for a very long weekend. 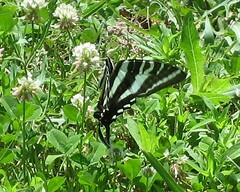 Last week I found this guy in the yard. 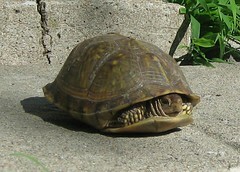 Actually da boys found him, I went to see about the ruckus they were making, poor little guy. Oscar was so interested in him he wouldn’t leave him alone. I guess that makes him a bully. I finally scolded him. He left the tortoise alone but he wouldn’t go away he just sat there watching it. Here he is trying to convince me he has no interest and just happens to be sitting there. I finally made him go inside.